Most advanced agility training revolves around the handling of dogs between obstacles, not the proper execution of the obstacles themselves. Weave poles are another matter. No obstacle is more difficult to master or to maintain. This is probably because the weave pole obstacle is the only one that does not come naturally to the dog - or to the handler for that matter. There are four major agility titling organizations in the United States and all have very similar requirements for weave pole execution. The poles are set in a straight line numbering from six to fourteen. The poles must be equally spaced apart, but that distance may vary from 18" to 24" depending upon the type of competition. 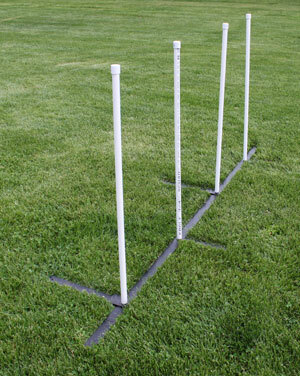 The dog's task it to enter the poles with the first one on its left and to weave in and out of the remaining poles until they are completed. When we speak of "finding an entrance," we refer to the requirement of entering the poles in this manner, no matter what the angle of approach to the obstacle or the orientation of the handler to the dog.